If you study the history of the cryptocurrency Bitcoin you realize that Bitcoin has been a really rough ride since it was launched around 2009. If you haven't studied the history of Bitcoin you should read the book Digital Gold by Nathaniel Popper which covers events up to 2014, so you have to google the rest. 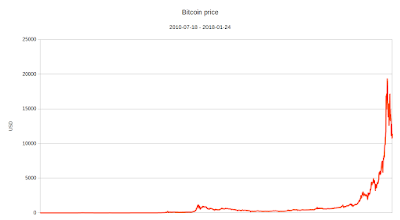 If you google you will see that Bitcoin reached a price of around $20000 in December and has been falling since. You keep seeing comments that Bitcoin is a bubble and this is a crash. But listening to comments by random people on the Internet is not always a good idea. A better idea is to use data and study what has happened before. The data I found is from Coindesk and ranges from 2010 up to today. It consists of one price during the day and not necessarily the highest or lowest price during the day, but that's not a big deal if you look at the price in a wider perspective. 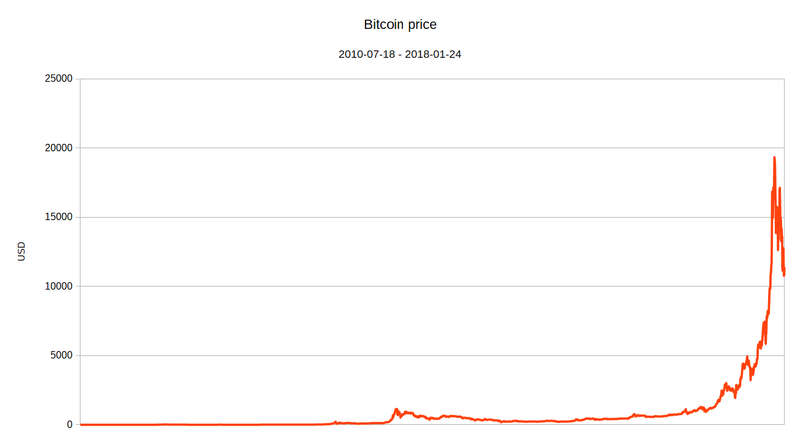 If you look at all the data you can clearly see that it looks like the classic bubble chart. But if you study the history of Bitcoin you learn that bubbles have happened before, so I thought it could be interesting to compare this crash with old crashes. How bad can it get? During this period I identified three major crashes, the longest lasted more than 400 days. There are also several smaller crashes where the price fell like 40 percent but the chart will become too messy if I include all ups and down. If you study historical crashes you see that the "crash" beginning in December 2017 is dwarfed by the major historical crashes. So from a historical point of view, the price could fall with more than 90 percent and still recover. Will it? No-one knows!